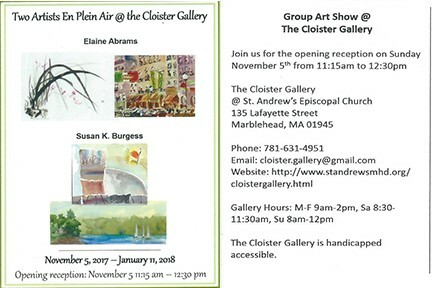 Winthrop artist Elaine Abrams and Marblehead artist Susan K Burgess will be showing their watercolors, painted on-site locally and abroad, as well as Japanese brushwork and watercolor collages respectively, at The Cloister Gallery of St. Andrew's Church, 135 Lafayette St., Marblehead, MA from November 5, 2017 through January 11, 2018. All are invited to join the artists for the opening reception Sunday, November 5 from 11:15 am to 12:30 pm. Marblehead Arts Association's members' exhibit shows an eclectic mixture of styles and techniques this year. Among them are a couple of quiet little oil paintings on the first floor - iconic views from Monhegan Island. One of them shows the cottage along the way to the ferry, its laundry flying high against a Maine-blue sky. The other is the house that Jamie Wyeth is purported to have lived in, jutting out to the sea over the rocky cove. Both will put the viewer back into summer and the Maine coastal experience. Another painting, this one a local view from Fort Sewall's cove, hangs downstairs in the Tavern. It was painted in one day as part of the MFoA's Painting the Town event. In a mutual show of support, Susan K. Burgess produced a painted wooden codfish that brought in $520 in the online auction '50 Cods for 50 Years", a fundraising event for Marblehead Festival of Arts. At the same time, two of Burgess' paintings, "Corner House" and "Lookout Court" sold through being exhibited in two of the exhibits that took place over the four festival days. The buyers appear to agree with the artist and the organization that the festival is a win-win-win situation. After a day of painting at the little beach by Fort Sewall - perched over the stairway going down to the beach - Susan Burgess and many other 'Plein Air' artists relinquished their prime real estate to frame and hang their paintings at Marblehead Arts Association. All part of Marblehead Festival of Art's 50th year celebration, the one-day paintings will be on view through August 5 at MAA, 8 Hooper St., Marblehead MA. 'MAINE RETREAT', an oil painting by SUSAN K. BURGESS of Marblehead, MA, was among the award winners featured at University Gallery (70 Mt. Auburn St.), Cambridge to celebrate the 70th Anniversary of Cambridge Art Association. The Opening Reception on April 30 displayed a wide range of materials and styles that showed the depth and breadth of the CAA artist membership and seven decades of a creative and supportive environment. Salt Marsh, an oil painting by Susan Burgess, is among forty paintings in a rich and lively show mounted by Cambridge Art Association and juried by Ali Ringenburg, currently on exhibit at the University Gallery in Cambridge until March 5, 2015. Open 9 am-6 pm M-F; 9 am-1 pm Sat. September 8, 2014, Cambridge MA: The Cambridge Art Association is pleased to announce its 70th exhibition year, CAA at 70. The exhibition year kicks off September 12 with the opening of the 70th FALL SALON, in Honor of Mary Schein. The show runs through September 26, 2014, in both the Kathryn Schultz Gallery and University Place Gallery. Awards will be presented at the opening in honor of the late Mary Schein, judged by her widower Edgar Schein, who has provided longtime sponsorship and support of the Fall Salon, which features artwork in a range of media from 144 Cambridge Art Association Artist Members. "This painting is a wonderful reminder of the summers Mary and I spent in Maine..... The two coasts are totally different, with the young California coast plunging steeply into the sea, while the geologically much older Maine coast gently eases into the ocean as this painting so elegantly shows....The peaceful and calming and eternal vista of this painting could be seen over and over again all along the coast." Bonding with nature breeds a kind of spirituality that recognizes our role in the larger scheme of life, much as religion does. Recognizing this connection, the Cloister Gallery at St. Andrew's Church, on Route 114 in Marblehead, MA, is displaying a collection of four very different views of personal spirituality through October 9th. A new series of local oils painted 'plein air' in Marblehead and other locations on the North Shore by Susan K. Burgess are displayed alongside artwork by parishioners Steve Harrington and Susan Schrader, and poems by members of the Marblehead Zen Center. Call 781-631-4951 for gallery hours. One oil painting in the members' show by Susan K. Burgess, called 'Summer Cottage,' evokes a summer day on Monhegan Island and the freedom of open skies and sunshine; and another, called "Lookout Court" (oil) - in the Painting The Town exhibit (on the second floor landing) - was painted during one day on location for the Marblehead Festival of Arts event on July 3. Both paintings are available for sale and help support local arts organizations in Marblehead, MA. See my two favorite new works ('Cape Cod Canoes' and The Flower Shop') at the OPENING RECEPTION NOV. 24, 2-4 pm for the Annual Members' Holiday Show, featuring MAA members' original arts and crafts and a great gift shop. My new mini watercolors, new monotypes, and favorite oils and acrylic paintings will be featured among many other selections of artwork and crafts at the Opening Reception on Sunday, Nov. 24, 11:15 a.m.-to 1:30 p.m.at St. Andrew's Church, Marblehead. With exhibits changing and extending through the holidays, this is a great opportunity to pick up handmade, original crafts and artwork as gifts of inspiration. On view at Kathryn Schultz Gallery, 25 Lowell St., Cambridge, MA Tues.-Sat., 11-5 pm and University Place Gallery, 124 Mt. Auburn St., Cambridge, MA, Mon-Fri.9-5, Sat. 9-1. Opening is Thurs., Sept. 12, 5:30-7:30 pm. I have entered a nice oil of one of my favorite spots in Italy, which will go back on my wall if it doesn't find another home. You can see it on my gallery, under 'Travel', called 'The Next Hill,' (or in person at this show!). Located at 181 Essex St., Salem, MA on the Pedestrian Mall near the PEM garden, this show is the 7th annual show inspired by a Peabody Essex Museum exhibition, in this case 'Faberge Revealed.' Judged by Dean Lahikainen, PEM's Curator of American Decorative Art, this show includes two of my paintings, "Gift of the Sea" (water media) and "These Are For You" (oil). All are invited to the opening on SATURDAY, SEPT. 7 from 4-7 p.m.
Abbot Hall is the site of the juried Painting Exhibit for Marblehead's Festival of Arts, and nice to visit for the wide variety of work shown. My oil painting of sunflowers, called 'Eternal Summer' will be on display there for this short show. June 10- June 27, 2013. Stop by St. Andrew's Church in Marblehead and see a large selection of paintings and other creative endeavors by parishioners, including five of my watercolors done in Maine last fall. Come for a fun-full day of arts (visual, musical & performing) in downtown Marblehead, including my Open Studio and Garage Gallery. Watercolor demo scheduled at 2 pm, outside if possible. Maps available at the Chamber of Commerce, Marblehead Arts Association, and participating businesses. Apologies to my collectors for my negligence in posting my exhibits and happenings for 2012. I expect to do better in 2013 and will make a more concerted effort to keep you informed. "Artist's.... Along the Sea Shore" is an exhibit by seven artists, all long time artist members of the MAA, who will be exhibiting at The Gallery at Grosvenor Park, 7 Loring Hills Avenue, at Vinnin Square, Salem Ma from July 9 through August 4. The works by Susan K. Burgess, Concetta Donovan, Nancy Ferguson, Joan Colt Hooper, Jane McKenna, Ruth K. Rooks and Ellie Tomlinson will be focussed on reflections of the sea shore. There will be an opening reception on Sunday July 10, 3-5pm, with usual gallery hours 9am-7pm weekdays, 10am-6pm weekends. Coastal paintings by seven local women artists are on view at Grosvenor Park Art Gallery, 7 Loring Hills Ave., Salem, MA. Hours are 10-5 daily. Come for the Opening Reception Sunday, July 10 from 3-5 pm. While on the Marblehead Art Walk, stop by Susan K. Burgess Studio and Gallery at 3 Damey's Way, off Waldron St., (Abbott Hall area) to see paintings in progress, refresh yourself with food and drink, and perhaps place your own mark on a participatory group painting. Sponsored by Marblehead Chamber of Commerce and Marblehead Arts Association, the ART WALK is an annual event to connect business and art.